Romantic once worn Reem Acra dress in perfect condition. Sheer illusion neckline and back with the most beautiful, delicate embroidered lace. Long flowing a-line skirt. 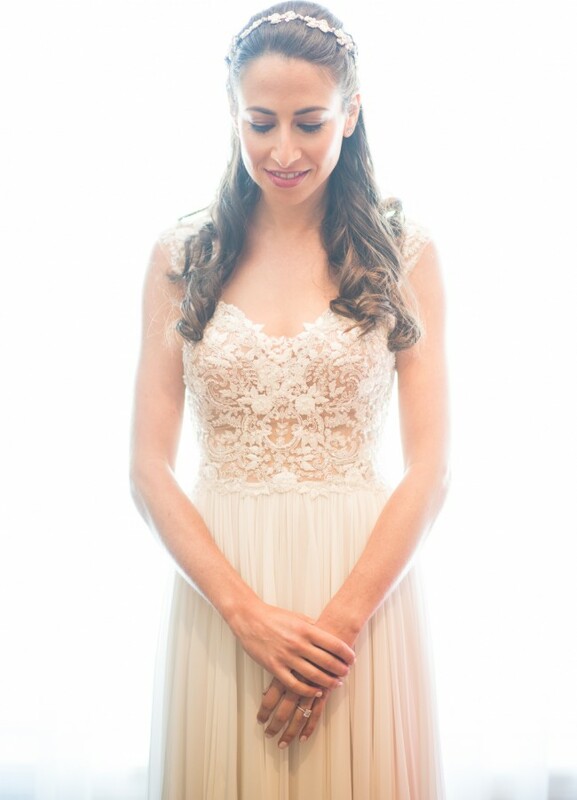 I purchased the dress in fall of 2017 for my wedding in the Summer of 2018. The dress is romantic, lightweight and moves nicely. Alterations done at Kleinfeld Bridal. Taken in around to bodice. Bust: 34" Waist 26" Low hip: 35.5"
Hemming of the multiple thin layers of the skirt to allow my height of 5' 5" with 2 inch heels to walk forward comfortably. Added an additional layer of lining to the skirt to; 3 layers total. I did not add cups to the dress. I wore a strapless undergarment The bodice is sheer around the lace pattern. Once you send a message, Dana can invite you to purchase the dress.